Baidu Tieba, the largest Chinese communication platform operated by Baidu, celebrated the 10th anniversary yesterday. As an online community closely bonded with Baidu’s mainstay searching business, Baidu Tieba experienced the most glorious days of BBS in China. The ten-year milestone may evoke some nostalgic and mournful feelings in the avid advocates of BBS, since several once ruling BBS platforms like Tianya and Mop witnessed severe user churn in face of the mobile era. However, Baidu’s founder Robin Li impressed us again by releasing several stellar figures for Baidu Tieba, a service launched on Dec 3, 2003. Baidu Tieba currently registered nearly 1 billion users and 200 million monthly active users, with over 8.1 million bars (someplace on the internet like a forum providing place for users to do interactive social network site activities), mostly created by fans, which cover popular stars, films, comics or books. The site records nearly 60 million posts per day and a daily average page view of around 2 million times (source in Chinese). The website enables users to search or create a bar by typing a keyword, bringing strangers who share same interests together to communicate and help each other expediently. Mobile Internet has brought walls of challenges to traditional social networking models, Chinese IT triumvirate known as the BAT (for Baidu, Alibaba and Tencent) all made moves to explore mobile networking division. Tencent operates the currently reigning WeChat which reportedly has 600 million registered users and Alibaba is catching up with Laiwang. Baidu released microblog service Baidu Shuoba in 2011 to tap social networking sector, but service was closed in the same year, mainly due to requirements on real-name registration. Baidu’s mobile strategy is taking form after it acquired 91 Wireless, one of the largest iOS and Android app distributors in China, for $1.85 billion earlier this year. Baidu Tieba, which already boasts a solid user base, is expected to be the next breakthrough point. Following the changes in web version, Baidu Tieba revamped the interface and function of mobile app version to better suit the habits of users in 2012. It changed from a simply reply-by-sequence user interface into a more complicated reply-in-same-floor one. 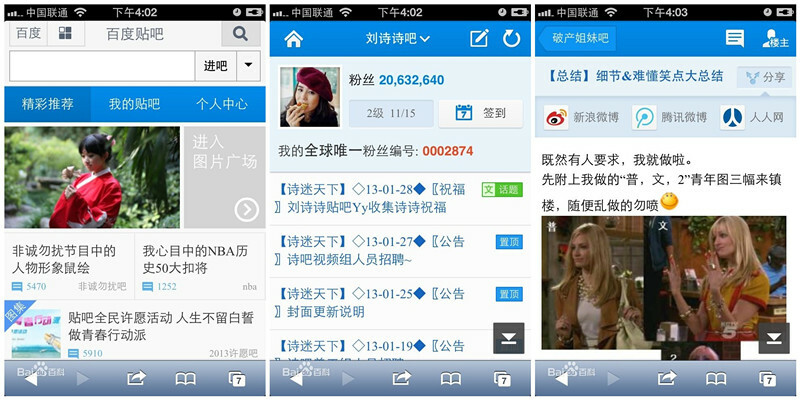 Meanwhile, Baidu Tieba also changed the front-page, layout and picture browsing methods, etc. The functions of voice message and group chatting were also added this year. The number of interest groups exceeded 2 million in 27 days after the launch of this new function in early May. According to a representative of the service, Baidu Tieba will open up the platform to partners, including enterprises, institutions, media and celebrities, to offer services such as constructing platforms for activities, data, and customer service. After running internal test for one month, hundreds of companies have settled on the platform, including big names like CCTV, Tmall, and JD, he added.